JPFO has mentioned the "Fairness in Firearms Testing Act" before. Introduced back in 2005 by Rep. Phil Gingrey of Georgia, the act would require all firearms testing performed by the BATFE to be videotaped, and to make copies of the unedited recording available to owners of the tested items and defendants in cases involving those items. You can read more about this act, which was directly inspired by the JPFO documentary _BATFE Fails the Test_ at www.jpfo.org/alerts/alert20050418.htm . 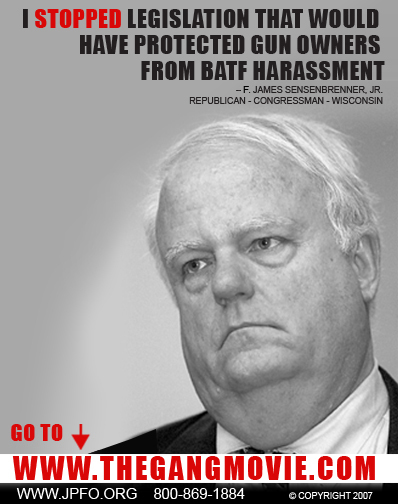 The bill died in the House Judiciary Committee, chaired by that great "friend" of gun owners, Rep. James Sensenbrenner. You can read more about Sensenbrenner here: www.jpfo.org/alerts/alert20050519.htm and here: www.jpfo.org/alerts/alert20050329.htm (you can also view our latest handbill mocking Rep. Sensenbrenner at www.jpfo.org/images02/handbillsensenbrenner.jpg ). Recently Rep. Gingrey attached an amendment to H.R. 3093, an Appropriations bill for the Department of Justice. The amendment stated, "Sec. 701. None of the funds appropriated by this Act may be used by the Director of the Bureau of Alcohol, Tobacco, Firearms and Explosives to pay the compensation of employees of the Bureau of Alcohol, Tobacco, Firearms and Explosives to test and examine firearms without written and published testing standards." In other words, if you don't test fairly, you don't get paid. That's reasonable, isn't it? Apparently the Appropriations Committee disagreed. On July 25, the amendment to H.R. 3093 was "debated". You can read the full text of both the amendment and the debate here: http://frwebgate.access.gpo.gov/cgi-bin/getpage.cgi?position=all&page=H8481&dbname=2007_record or http://tinyurl.com/2upx3a . Rep Gingrey: Here's my amendment; let's discuss it. Appropriations Committee: We don't want to talk about that right now. Rep Gingrey: Okay, I'll remove the amendment. What do you suppose is the likelihood that the Appropriations Committee will actually discuss this amendment further? We'd guess it's pretty slim. Compare this to the Real ID act, which was attached to a similar spending bill. It was passed unanimously, with no discussion, and without even reading the bill! (read more about that travesty here: www.jpfo.org/alerts/alert20050511.htm ). "[W]ithout written and uniform standards, gun manufacturers are left guessing about which agent will inspect the firearm this week, whether or not they will be able to ship a product out to potential customers, and whether or not BATFE agents might even prosecute someone because of a shipping mistake or a firearm malfunction. [W]ithout written procedures, BATFE has literally a free rein to mistreat manufacturers, change their mind after the fact, and leave both manufacturers and customers at a legal and financial disadvantage. In fact, BATFE regulations are so inconsistent that some manufacturers have been threatened with prosecution after receiving written approval for their products from other BATFE personnel. "Since 2002, 85 percent of American firearm manufacturers have been forced to close their doors. Let me repeat that, Mr. Chairman. Since 2002, 85 percent of American firearm manufacturers have been forced to close their doors. Moreover, with the increase in number of imported firearms purchased by civilians and law enforcement alike, our Nation is at a strategic defensive disadvantage." Your friends in congress did not give a damn.